Why should you add a throttle controller? Modern cars are constantly evolving, mostly due to advancements in electronics. A growing number of vehicle systems that were previously controlled by mechanical hardware are now controlled by the vehicle’s computer. One such new system is electronic throttle control, commonly known as drive-by-wire. However, the drive-by-wire system has its limitation, ECM controls the electronic signal to give instructions by identifying the depth of the accelerator pedal, and make the engine provide the matched power, unfortunately, the signal delay of electronic throttle valve will impede the normal acceleration of vehicles, under some circumstances, such as going uphill, there will be strong setback, even cause the vehicle’s sudden leap. 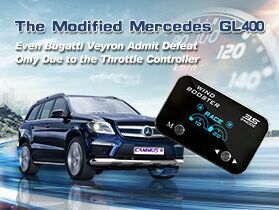 As car enthusiasts, we all appreciate the need for speed and thrill of pushing our cars to newer limits, to solve the problem, a new system has been developed to override the factory electronic throttle control settings and eliminate noticeable time delays, that is throttle controller, it will eliminate cables between gas pedals and throttle bodies. And we are glad you found us, Windbooster throttle controller will help you adjust throttle application for better driveability and take your ride to a higher level. 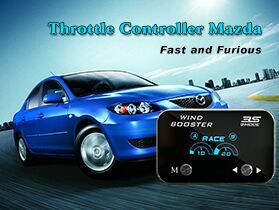 Choose one throttle controller here, eliminate throttle lag now! It will make driving a car easier and safer!! 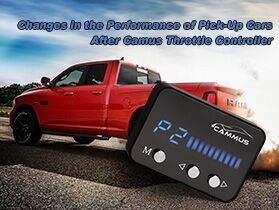 Since founded in 2008, Cammus has been focusing on the R&D of automotive electronics and promotion, particularly in automotive performance and power modification, including electronic accelerator, throttle controller, intelligent driving controller, racing gauge, engine computer, automobile control arms, titanium exhaust, tower bar series and so on. Cammus has famous brands as follows: WINDBOOSTER, EVC and DKP AROUIG. With the concept of science humanization, we are committed to the R&D and marketing of automotive refitting parts, focus on the development strategy of automotive aftermarket service. Over the years, Cammus keeps developing and surpassing itself, and has created a series of epoch-making technological achievements, acquired a number of technical patents, professional company image with superior technology have been firmly established. Our aim is to provide a full range of high-quality automobile speed-up products, comprehensive and effective technical support and professional automotive service network for customers. We will take every customer as our partner and friend, promote our brand to the automotive aftermarket of the whole world.